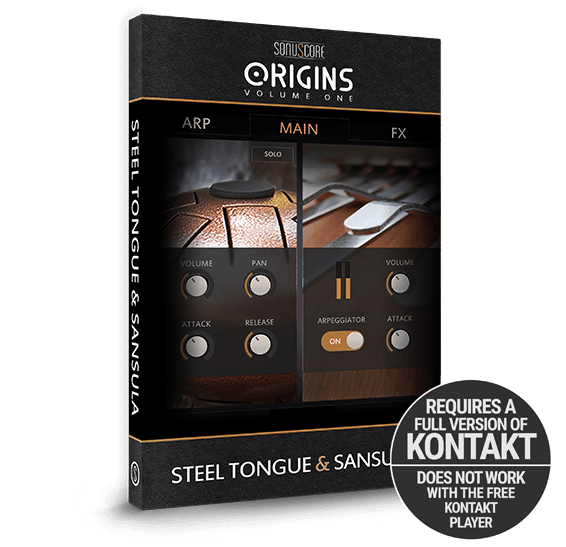 ORIGINS VOL.1: STEEL TONGUE & SANSULA is the first installment of the SONUSCORE ORIGINS Series, a new line of instruments developed by the critically acclaimed team at Dynamedion. 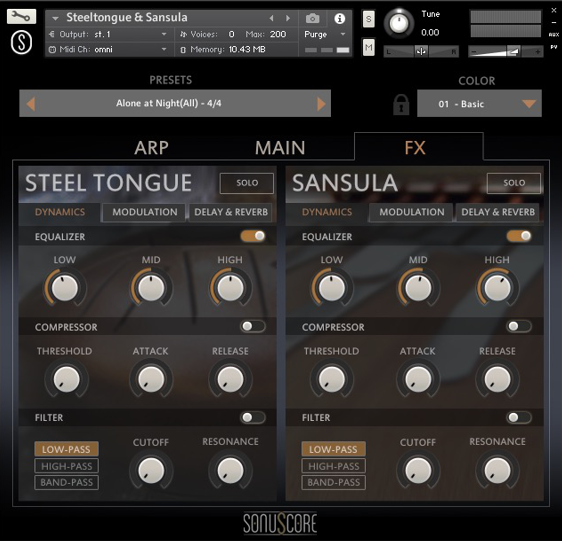 Two unique instruments combined in the powerful Multi-Arpeggio-Designer (MAD) meld into rich and diverse sonic landscapes. 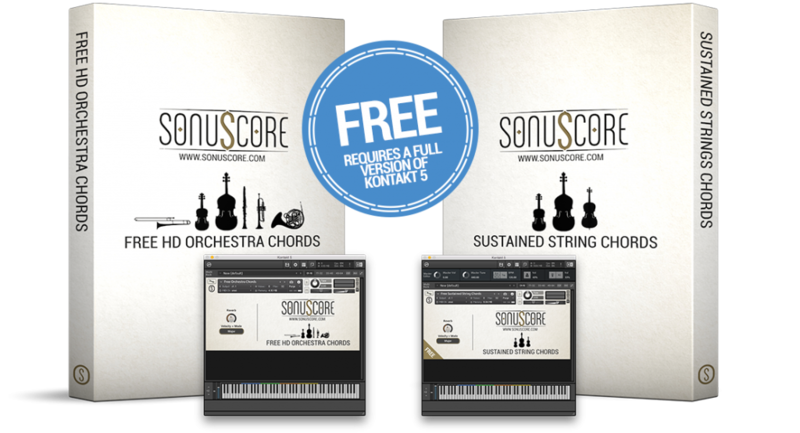 With a vast set of inspiring presets and easy customization, the Sonuscore Origins Series provides extensive possibilities for creative scoring. The Sansula is a recent advancement of the Kalimba, which has its roots in traditional African music. Played by plucking metal tines attached to a membrane, the Sansula has a soft, but rich sound. The Steel Tongue Drum is a modern intrument played with mallets or by hand. With its percussive sound, it forms the perfect pendant to the Sansula. 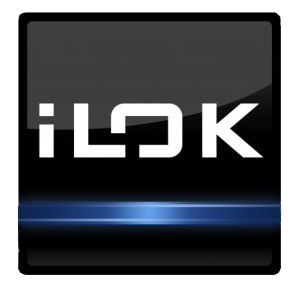 Load up one of 80+ inspiring presets or create your own arpeggios in as much detail as you like. The MAD provides a variety of different features and controls to realize your musical vision. 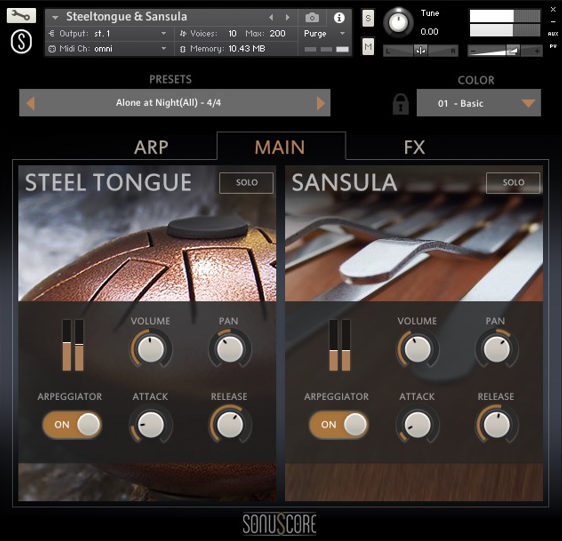 The 12 individual color-presets provide even more possibilities to sculpt your sound. All colors are radically different in character and incorporate various effect settings and multiple impulse responses. While each MAD-Preset has an assigned color preset, you can combine everything at will, resulting in over 900 predefined combinations. „All three titles in the Origin series cover a full gamut of styles but at the same time sound familiar to each other. 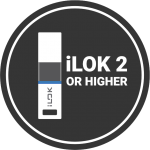 These libraries would suit film, game soundtrack and sound design composition perfectly, but I wouldn’t be surprised to see the urban hip-hop and EDM guys picking up on this series for some edgy texture to their tracks." „The magic begins… the first Kontakt-instrument of the Origin-Series: Steel Tongue & Sansula is a real no-brainer for me. 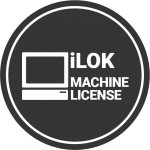 Lightweight, compact and extremely easy on memory does it make fantastic sounds, arps and athmospheres, all customizable to the bone in a clever and intuitive interface. This will be used in many of my tracks to create mysterious to joyous moods in an instant thanks to the nice presets. 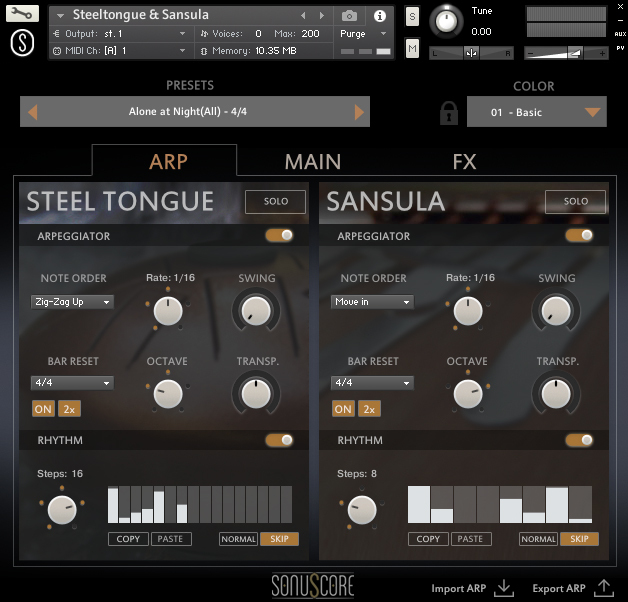 Hint: Use the 3-note-presets with 4 or more notes and vice versa to create some extra complexity."